Music is everywhere! Over the next few weeks of summer, I encourage your children to listen for the music in the world around them. Challenge them to identify sounds each day and classify pitches as high or low, loud or soft. Classify repeated sounds as fast or slow. Listen critically to the sounds of nature and compare/contrast what you hear (a particular bird may have a higher call than another or sing a melody that descends or repeats). For an added challenge, try to imitate what you hear. Can you make your voice do that? As you begin to hear the music in nature, explore non-traditional ways to make your own music. Create funky rhythms with buckets and sticks, pots and pans, hands and feet. Create a beat with the sweeping broom and make up a song to go along with it. There are also many wonderful educational music websites. A few your children might enjoy include Classics for Kids and the New York Philharmonic KidZone. I love reading mysteries and thrillers. Throughout the school year, I encourage students to read books based on their personal interest. During summer break, I am reminded of the enjoyment and escape that I experience when reading. I also think about my students and hope they are filling some of their leisure time with reading. Whether reading for enjoyment or information, books can be an endless source for discussions and activities. If you are planning a trip to the beach, read a fiction book with a beach setting or a nonfiction book about the ocean or animals. Thoughts and questions that arise can lead to further reading and research. Stretch your imagination. Children can write their own story, answer a question through experimentation, or prepare a recipe. Do an internet search for a kid friendly recipe. Have your child read the recipe, write out a grocery list, and prepare a meal together. It is hands on fun involving language arts and math skills. Everyday tasks provide many educational opportunities, as well as valuable time spent with your child. And when the school year begins in August, students who have read and participated in learning activities start with an advantage. As a former teacher and educator for the past 20 years, I realize the importance of continuing education throughout the summer months. 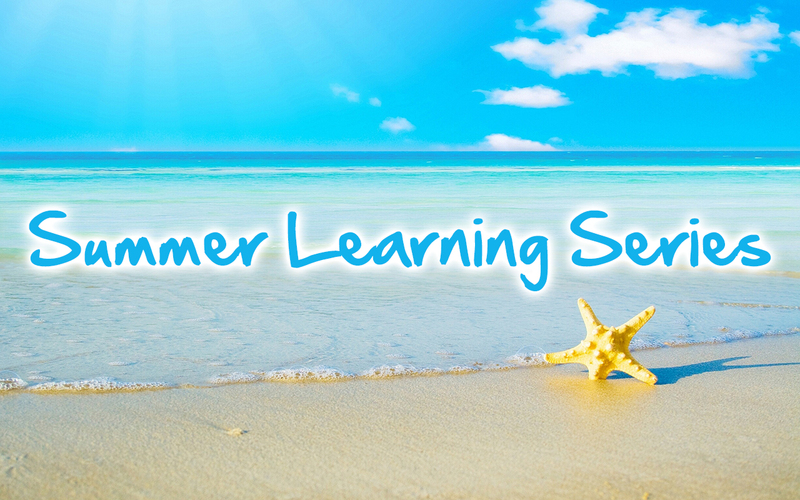 Learning is something we all do naturally as we encounter new experiences, so it only seems fitting that learning doesn't have to end in the summer. Mathematics is all around us, occurring in nature and in the manmade objects we see daily. One way to continue learning math in the summer is to play a game of "I Spy". As you run errands daily, or travel to new destinations, look for shapes in the flowers, trees, and buildings around you. Young children could look for basic shapes like squares, triangles, and circles. Older children could look for the angles like acute, obtuse, or right angles. Everyone can look for patterns. Repeating patterns may be found in gardens, art work, or signs. Growing patterns can be found in elevators, street addresses, and on your car's speedometer. Shopping is a wonderful learning experience in math. Children can make estimates on prices, figure out costs with percentages of sales, and count money or make change. Enjoy your summer and take every opportunity to see the math around you on your journey! Lazy summer days are the perfect time to settle in with a good book, and the best way to share a book with your kids is to read aloud. You may have read to your kids when they were younger and have gotten out of the habit now that they are a bit older and can read books on their own. But the benefits that older children gain are just as strong as they were when they were younger, and reading aloud to kids, even older kids, is the best way to help them develop into lifelong readers. By delving deeply into an excellent story, you are sharing an experience with them that will be rich with relationship building moments. Noted author and respected educator Lucy Calkins (1997), in Raising Lifelong Learners: A Parent’s Guide, says that read-aloud is the time to go under the “spell” of a beautiful book and laugh, cry, and get lost in the flow of the story and the language. So set aside some time each day this summer to snuggle up on the couch and take a trip through a good book with your kids. "A while back I paid a little bloggy homage to an awesome local learning facility, right here in good ol’ K-Town. That place was Tate’s School, Knoxville TN and the experience I had touring this preschool and elementary school was just remarkable. I raved in my review about not just the facility itself (both beautiful and embedded firmly in nature and a simple, exercise oriented design – the kids stroll, play and move throughout their day, just like kids should! ), the politeness of the young students I was fortunate enough to encounter while there (blew me away! ), or their fantastic, activity driven views on important community issues like nutrition and multiculturalism, but also about the great Tate family that both founded and run this local gem." Click here to read the full post on The Blossoming Bump site! Summer is a great time to foster the love of reading. Children learn by watching others, so be sure to let your children "catch" you enjoying books this summer! Explore your library and take advantage of summer book clubs and reading challenges. If your child has struggled to find something to read this summer, take the time to sift through piles of books at McKays or other local bookstores with them. Encourage your child to read what THEY like to read this summer. This will build a strong foundation and love of reading. Finding fun ways to carve out reading time is also a great way to make reading fun! Build a cool indoor tent with sheets and pillows to beat the heat or create a shady oasis in the back yard with soft blankets and cool treats! Most people travel a few times during the summer and this is a great opportunity to work on map skills. Before taking your trip, sit down with your child and look at an atlas. You all can work together to find the best route to your destination! Don't forget about all of the great learning opportunities right here in East Tennessee! The East Tennessee History Center would be a great place to visit for a fun "family field trip"!